I've made some progress with the yarn I was spinning yesterday and the day before. I have three skeins completed, and I'll probably get about 4-5 more out of those two sweaters. 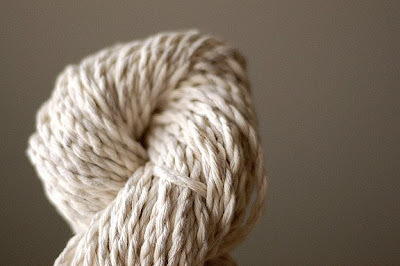 A finished skein: They are pretty big skeins, cotton yarn is SO heavy, it is almost rope-like when it is this bulky. 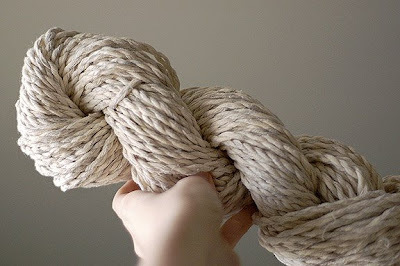 Even though it is heavy it is still really soft and drapes well. I've still got a ways to go. If you look closely at this pic, you'll see Bo, my cat, is trying to get some attention. That soo makes me wanna hop to the nearest thrift shop to grab some XL woolen sweaters to spin up. Wow. What do you plan on doing with the finished spinnings? If you had oodles of yarn, I bet it would make a great blanket! 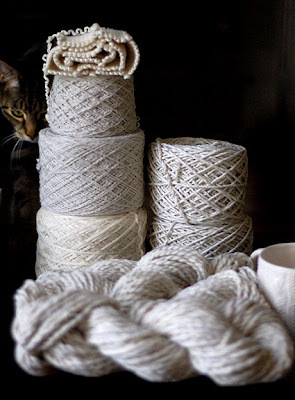 oh, that yarn looks great! So jealous right now. 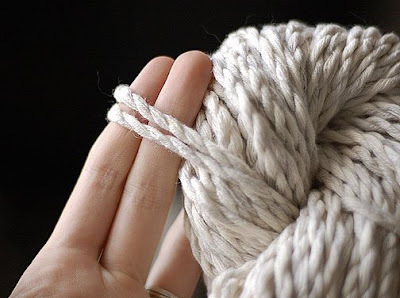 Thanks...now I want to start spinning so I can get some chunky yarn like that.